When most people think about bacterial antibiotic resistance, they think about it occurring in bacteria found in people or animals. But the environment surrounding us is a huge bacterial reservoir, and antibiotic resistance can be passed between bacteria in the environment, including in the soil. Sid Thakur is an associate professor of population health and pathobiology at the College of Veterinary Medicine and associate director of the Comparative Medicine Institute at NC State. He studies antibiotic resistance and how it can persist and spread among food animals, humans and the environment they all share. Recently, Thakur found that spreading manure on the ground as fertilizer can also spread antibiotic resistance to bacteria in the soil. Bacteria contain small DNA molecules known as plasmids. These plasmids are separate from the bacteria's actual DNA, and can pick up and exchange genes between bacteria. Picture a group of people staying in your house, cooking their own food and taking care of themselves independently of what the family is doing. That's the relationship plasmids have to bacteria's DNA. Then picture these plasmid "houseguests" shipping items that they select from your house to your neighbor's house, and receiving packages in return. Essentially, that's what the plasmids are doing with genes – including genes that give the bacteria's "home" the ability to become resistant to antibiotics. Thakur took soil samples from a swine farm prior to and for three weeks after a manure spread. He had previously tested the manure for antibiotic resistant strains of salmonella, a pathogen responsible for causing the highest number of bacterial foodborne illnesses in the U.S. every year. There are over 2,500 unique serotypes of salmonella, and they can be found all around us, including in soil. After sampling the soil, Thakur found that antibiotic-resistant salmonella bacteria were still present in the manure up to 21 days after it had been spread. He also discovered that a particular plasmid associated with the antibiotic-resistant salmonella from the manure, which weighed around 95 kb, was now turning up in different salmonella serotypes from the soil samples (kb stands for kilo-base pair – a measurement used to identify plasmids). And every serotype with plasmid 95 kb was now resistant to antibiotics. "This tells us that this particular plasmid is shuttling across different serotypes," Thakur says. "It could explain why we find antibiotic resistant salmonella strains even on farms that don't use antibiotics. It seems that once antibiotic resistance takes hold, it doesn't go away. 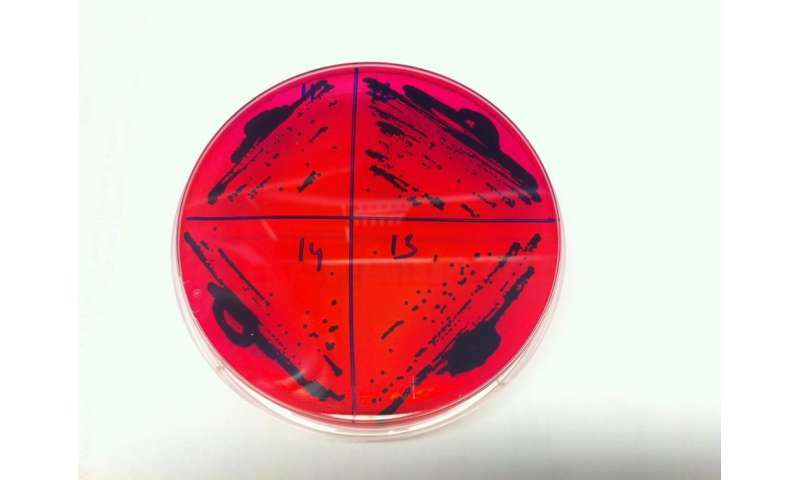 These bacteria are simply better equipped to survive and so they prosper." Thakur's work was published in Applied and Environmental Microbiology. Do people and pigs share salmonella strains?